Coconut oil is an extremely healthy saturated fat that is known to help with many common ailments ranging from mild skin conditions to oral hygiene. Coconut oil doesn't contain your standard saturated fats that can be found in the likes of cheese or steak. Instead, it is packed full of medium-chain triglycerides (MCTs) - These medium length fatty acids are metabolised differently in the body and account for many of coconut oil's unique health benefits. As well as the healthy fats, coconut oil also offers a range of antimicrobial properties that can help boost the immune system in both humans and canine and feline friends alike. 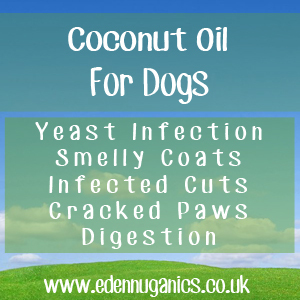 Coconut Oil for Your Dog; It's Easy and They Love It. Yeast infection - Dermatitis caused by yeast is a fairly common inflammatory skin condition in dogs of all breeds. It is caused by overgrowth of a species of yeast known as malassezia which usually makes its home in the skin and ears. Smelly coats - No one wants to have a smelly pup! Luckily, coconut oil can help once again. Applying coconut oil to your dog's coat will not only moisturise it and leave it with a glossy shine, but also remove any nasty odours that have been hanging around since the last rainy walk. Cuts that have become infected - That's right! coconut oil can even disinfect cuts and grazes due to its powerful antibacterial properties. Simply apply a small amount to the affected area until symptoms improve. Cracked paws - Cracked paws can occur for many reasons and can often be highly uncomfortable for your canine companion. Coconut oil will give the paws the moisture they need to heal and repair properly with the added antibacterial benefit. Digestion - The natural fats that make up coconut oil can help to reduce bad bacteria in the digestive tract and increase absorption of key minerals and nutrients that keep your dog healthy and active way into later life. Thyroid function - Hypothyroidism is the most common hormonal disorder diagnosed in dogs. It occurs when the thyroid glands, located near the throat, are unable to produce enough thyroid hormone. Coconut oil has been said to help balance hormones. Fungal infection - Fungal spores are present in most environments and are able to take hold if your dog is suffering from a weakened immune system. Aspergillosis is an opportunistic fungal infection caused by the aspergillus fungus, a species of common mould found on everyday materials such as dust, straw and grass clippings. As mentioned before, coconut oil has antifungal properties. Weight control - Does your dog seem to pack on the pounds faster than others? Coconut oil could help to raise your pets metabolism, meaning they burn more calories throughout the day! Oral Health - The antibacterial properties of coconut oil help to remove unwanted bacteria from your dog's mouth as well as cleaning the teeth and helping to treat gum disease. Cats - 1/4 of a teaspoon a day mixed with food. Dogs - Medium size dogs will benefit from around 2 tablespoons a day mixed with food. For any dry skin or skin issues apply coconut oil directly to the skin as needed.